Small and medium sized businesses have challenges of their own. They need considerable effort to set up infrastructure, hire the required manpower, draw up a budget, procure equipments for Business success and so on. Additionally, they also need to provide for safe and secure storage of data. Thankfully, business cloud storage solutions have made this last aspect a great deal easier for businesses of today. Gone are the days when business entrepreneurs had to prepare for online storage, set up LAN infrastructures for storing data online, manage costly self owned servers and so on. Today, we have business cloud storage solutions that can take care of the entire storage aspect. • Plans that have a limited storage per user. • A cloud storage plan that provides unlimited space for storage. The catch for assured business success is to choose the plan carefully. The right choice is one that fits your requirements and your budget appropriately. You need to assess your affordability and choose the best plan that fits in. Drawing up a budget for your storage plans is not difficult. However, if yours is a small or medium sized business, the budget constraints might be quite significant at the outset. You may be low on funds and apportioning the funds for a business cloud storage solution may prove to be a bit of a challenge. Therefore, shared hosting plans that come for cheap may prove to be the best solution here. However, there is a catch involved. It is important to remember that small and medium sized businesses are scalable. They are likely to grow and develop. And growing needs require more specialized systems. A shared hosting plan might not suffice in such cases. You will require more space, more specialized infrastructure, and more facilities for supporting your growing businesses. In such cases, shifting your storage plan may not be possible and could be immensely cost intensive. Therefore, scalability should also be taken into account when choosing a business storage solution for your growing enterprise. It is important to have a fair assessment of how much your business will grow before opting for a solution. It should be a stable, scalable storage plan that a company can rely on. Every business needs to keep its data safe and secure from undue threats. It is important to ensure that your business cloud storage solution offers complete security to data. Read through the SLA or the service level agreement carefully for understanding the safety and security mechanisms that are in place. It is important to understand the firewall mechanisms, encryption systems that the storage system has engaged for protecting your data. It is important to understand that a shared hosting plan may not be suitable for an ecommerce business or a business that deals with confidential data. In a shared hosting, the platform is shared by multiple users. Hence safety and security is compromised. This is why we need to choose a private hosting plan where the access would be limited to a single user alone. And if it is an ecommerce business, customers would be processing payments on these platforms. Hence, the safety has to be of high order. 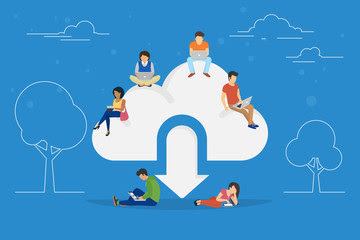 One best way to choose a cloud storage plan for your business would be to resort to a comprehensive comparison before making a choice. There are quite a few comparison sites that can be sought for help.